After applying a herbicide to a field with weeds, the herbicide needs to follow a certain path in order for it to be effective. 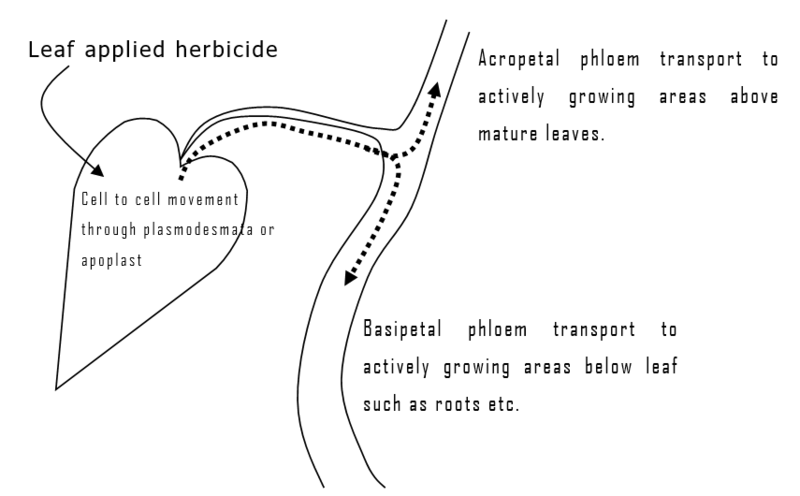 Secondly the herbicide must be trans-located through the plant in order to have any effect on plant growth. Any chemical that is not trans-located cannot have any effect on plant growth, be it positive or negative. The herbicide must have an effect on plant metabolism. If it does not have any effect, the herbicide is said to be selective. Roots are ideal organs to absorb herbicides, in some cases they are better suited that leaves. Root absorption of herbicides is either passive or active, some herbicides are absorbed actively and others passively. The vast majority of herbicides are absorbed passively. Herbicides are absorbed through the first 50mm of actively growing roots. The herbicides enter roots via the apoplast, the symplast and the apoplast-symplast complex. Herbicides that enter through the apoplast move exclusively through the xylem. Herbicides that move through the symplast have to move through cell walls, them into the protoplasm of the epidermis, cortex or both. The herbicide remains in the protoplasm and sequentially passes into the endodermis, stele and phloem by means of the plasmodesmata. 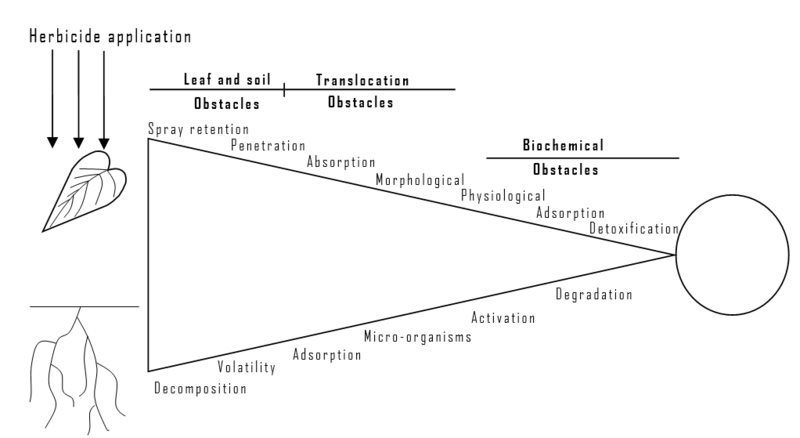 Herbicides are rapidly translocated upwards from the roots through the xylem, which is powered by the transpiration stream. Certain herbicides are more effective when absorbed by the underground organs. The soil applied herbicide must come in contact with the root system or the seed in order to have any effect. 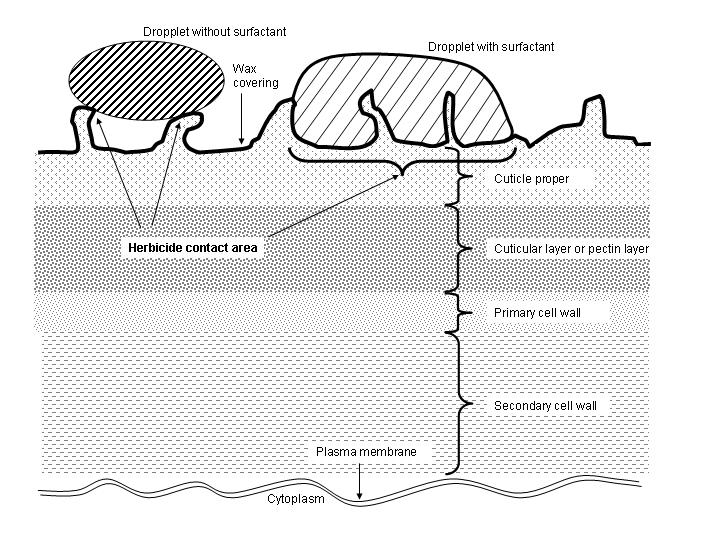 Foliar absorbed herbicides penetrate the cuticle and cell walls by diffusion. The plasmalemma is penetrated after which the active ingredient of the herbicide can start its work in the cytoplasm (Figure 6). The movement with which herbicides move through the epidermis is an active energy consuming process. A graphical representation of the epidermis of a leaf. Note the difference between the contact area of a water or herbicide droplet with and without a surfactant. It used to be assumed that herbicide entry into stomata was an essential pathway into the plant cytoplasm, however, the latest research has indicated that this is not the case. Even if the herbicide enters through the stomata, it still has the reach the cytoplasm which is just as difficult as from the leaf surface. All herbicides, contact and systemic, must move through the epidermis and be translocated through the plant to have any effect. It has been found that polar solutions are not as effective as non-polar solutions and they have different pathways through which they enter the plant. Water and salts are polar and oils are non-polar. The problem that chemists have is that the cuticular wax or is the most hydrophobic (non-polar), or water “hating” part of the leaf, followed by cutin, pectin and cellulose layers with each layer getting more polar. Thus non-polar herbicides such as oils enter the outermost layer of the leaf relatively easy while the experience more resistance as the move deeper into the leaf epidermis. The opposite is true for polar herbicides, they have difficulty in entering the wax layers but find it easier the deeper they penetrate. The goal of the chemists is to design herbicides which are not at the extreme of polar and non-polar, but a mixture in between. Many surfactants reduce the volatility of the herbicide which retards the drying out of the spray solution on the leaf surface. Atmospheric temperature: It can increase or decrease absorption rate. Plants that grow in areas which have high temperature tend to have thicker wax layers. High temperatures during spraying causes higher loss of herbicide due to volatility. Low temperatures tend to reduce plant metabolism and reduces the activity of the herbicides dinoseb and bromoxynil. Rain: Rain can wash the leaf surface if it follows directly after an application. The influence of rain will depend on herbicide applied and the type of plant sprayed. Some herbicides tend to be absorbed relatively quickly into the leaf while others take a while. Non-polar herbicides will tend to stick stronger on the leaf surface than polar herbicides. Wind: Wind increases the rate at which the herbicide evaporates and the amount that is lost due to drift. Shoot absorption is important during the germination of especially grasses. The coleoptiles that emerges through the soil surface are highly susceptible to herbicide penetration since it has a very thin layer of wax on its leaves and they are usually actively growing seedlings. The high metabolic rate increases the rate of herbicide translocation which reduces the time the herbicides takes effect on the plant (seedling). The only time that stem penetration is important is on woody plants. Although by spraying the herbicide on a plant some of the droplets will inadvertently come in contact with the stem of the plant. Covering the stem will only increase the surface area of contact which will increase the effectiveness of the herbicide. Some herbicides favour the symplastic pathways while others favour the apoplastic pathways and then other use both the pathways equally. Before autumn when plants tend to store reserves in their root systems. Herbicides that are applied on leaves of weeds have to move through the epidermis as previously explained, then from cell to cell through the plasmodesmata or apoplast after which it can enter the phloem in order to be transported either upwards or downwards (Figure 7). Absorption of herbicides that use the apoplastic pathway start at the roots. The active ingredient of the herbicides do not actually interfere with the above processes but rather they block, or disrupt some of the reactions which take place in these processes. The inhibition of the carotenoid or chlorophyll formation process. The active ingredients that are responsible are: amitrole, fluridone, norflurazon. Interference with the electron transfer Photosystem II. The active ingredients that are responsible are: bromoxynil, buthidazol, Fluridone, Ioxynil, Metribuzin, propanil, pyrazon. They act as inhibitors of the electron transport system. The active ingredient of the herbicide either combines with the electron carriers or intercepts the transport of the electrons. Herbicides that target nitrogen metabolism affect the nucleic acid synthesis process through stimulation of inhibition of the activity of the enzymes DNase and RNase. Their effect is either an increase in proteins, amino acids or available nitrogen in the leaves, stems or other storage organs. By changing the molecular structure of enzymes they interfere with normal processes in the nucleus of the cell. Herbicides compete with the non-protein cofactor of enzymes for the protein component. They compete with the enzyme for the active sites of the substrate. They impede the activity or stimulate enzyme activity through complex forming with either enzyme or substrate. The active ingredient of the herbicide changes the active component or the cofactor portion of enzyme, thereby alienating the cofactor portion from the protein portion. The active component of the herbicide interferes with the production of ATP which adversely affects the production of energy to the plant which is required for all processes especially growth. They influence the production and concentration of co-enzymes which reduces the effectiveness of enzyme productivity. Apply to much herbicide per area, thus wasting expensive chemicals without increasing the amount of weeds controlled. Cause large amount of drift resulting in too little active ingredient reaching the target and some of the drift affecting neighbouring commercial crops. The varying volume concentrations used will depend on the characteristic of the surface which is being sprayed. The total volume sprayed on a soil surface would be more than the total volume that is required if only the leaf area is sprayed. The higher the total volume used to spray, the more even will the application of the herbicide be. The higher the concentration of the herbicide is, thus the higher amount the active ingredient dissolved, the more difficult will it be to apply the herbicide evenly. Concentration of herbicide required and the type of coverage it is referred to. Examples of some active ingredient concentrations, dosages required of the herbicide and the application type. Note these are examples only. The leaf growth angle, thus how vertical does the leaf grow. The more upright the leaf grows, the more difficult will the herbicide stick to the leaf. If the leaf grows horizontally, the herbicide will lie on top of the leaf and has enough time to penetrate the cuticular layer. Some weeds have many leaves at the top of the plant preventing the herbicide penetrating the bottom leaves. Other weeds have heavy growth lower to the ground so penetration is effective in the top layers. The amount of hairs growing on the leaf will have a significant effect on the ‘clinging’ ability of the herbicide especially if the leaf is growing very upright. Atmospheric conditions can play a significant role in the effectiveness of the herbicide application. Atmospheric conditions determine how much of the active ingredient reaches its target in relation to the amount of herbicide applied. Conditions such as temperature, humidity and wind are important atmospheric conditions that will influence the amount of herbicide reaching its target in relation to the amount applied. By mixing the herbicide with oil based solutions drift and volatility can be reduced, thus increasing the amount of herbicide reaching the target. The pressure can also be reduced in order to increase the droplet size. Herbicides with dissociable groups attached are pH dependant during uptake. The dissolvability of the herbicide in oil can be improved by altering the dissociable groups. Young fast growing leaves are more susceptible than older mature leaves to herbicide penetration and uptake. Thus a plant with relatively more younger leaves than older ones will absorb the herbicide faster. Older more mature leaves have thicker and more develop cuticle layers which make penetration slower and less effective. Leaf that are injured through either insects or diseases are more susceptible towards herbicide penetration. It is a well known fact that healthy growing plants absorb herbicides faster than stressed out plants. Quite often growers will apply some fertilizer and water to the soil in order to enhance the growth of the weeds in order to control them better. The reason is that fast growing weeds have thin cuticular layers making it easier for the herbicide to penetrate. The fast growing plant has also higher flow rate of cytoplasmic fluids thus the transport system within the plant is also more effective. If a herbicide droplet reaches a leaf, the water will evaporate over time but the active ingredient of the herbicide will not. The result is that the concentration of the active ingredient in the droplet is increasing over time which increases the rate of uptake per unit of leaf area as time goes on. Although it is mentioned above that the higher concentration increases the absorption rate, there are situations that the herbicide might form a precipitate if the concentration exceeds a certain level. Once the precipitate has been formed, the herbicide loses its characteristics. In some cases droplet size is more important than concentration. In other cases the translocation might be impaired due to damage to cells in the transport pathway by using to high concentrations. Some properties of herbicides have the ability to injure the surface of the plant physically due electrostatic characteristics of both the herbicide and plant surface. The result is that the active ingredient can penetrate the leaf surface quickly without any barriers. It is important to note that surfactants do not always enhance the uptake of herbicides. Some herbicides should not be used in conjunction with a surfactant since their chemo-physical properties have certain properties that are cancelled out if surfactants are added. The most important factors are relative humidity and temperature. During periods of high RH, the droplets stay on the leaf longer leaving more time for the herbicide to penetrate before it is evaporated. The same applies to lower temperatures. The water status of the plant has also an effect. By increasing the water status of the plant, through irrigation or just after good rains, the uptake, translocation of solutes are more effective that under water stress. During water stress periods the stomata are closed, thus reducing the effectiveness of herbicide uptake. It is obvious that if it rains directly after applying a herbicide its effectiveness will diminish substantially. Any factor that influences the rate of translocation of nutrients inside the symplastic or apoplastic channels, will influence the transport rate of the herbicide which has either been absorbed through the above ground organs or below ground organs. These are some of the conditions that reduces water flow in the plant due to stress, be it either moisture or temperature related. Physiological and morphological plant characteristics that influence the translocation of the active ingredient of the herbicide. The active ingredient must be transported in large enough concentrations in the plant to the specific site where the damage can be done. There are many barriers within the plant that reduces the effectiveness of the active ingredient of the herbicide. Many of these are shown in Figure 8. The ability of some herbicides to affect only certain species is called selectivity and is one of the useful aspects of modern herbicides. There are two types of selectivity: true selectivity and placement selectivity. True selectivity is the reaction of various plant species to applied herbicides. Placement selectivity is when the herbicide is applied without coming in contact with other plant species.